Xplor, one of the most popular attractions in Cancun and the Riviera Maya, reached its 2.5 million visitor in April 2017. Since its first year of operations in 2009, Xplor has innovated the industry of zip lines. 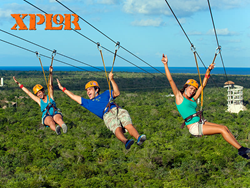 Xplor, one of the most popular attractions in Cancun and the Riviera Maya, recently reached its 2.5 million visitor -- making it the most visited zip line attraction in the world, according to Operations Manager Armando Ruiz Villalobos. The success of Xplor - an adventure park within the Experiences Xcaret Group portfolio - is thanks to the beauty of its natural landscapes and its high safety standards, Villalobos said. Villalobos emphasized the park’s Association for Challenge Course Technology (ACCT) certification as another reason for Xplor’s success. By working with ACCT officials, the park is aligned with an international organization whose mission is to ensure the safety and integrity of those who practice adventure activities in theme parks and entertainment centers. "Since its first year of operations in 2009, Xplor has innovated the industry of zip lines. We installed two horizontal cables instead of just one, as was normally done; we created special platforms that transmit tranquility and security to people of all ages; we place fixed guides in each tower, to maximize the operating times and to make more agile the route of the circuit, and we created an automatic braking system,” Villalobos said. "Innovation has been a fundamental element of our success, and we will continue on that path." Building on the success of its zip line attractions, Xplor will continue to expand; by the end of 2017, the park will have an additional attraction that will be a must-see thrill for both returning guests and those discovering the adventures of Xcaret for the first time. At Xplor Fuego, adventure evolves. At dusk, torches are the only guide through this underground park. A ring of fire ignites the only nighttime zip-line circuit at Cancun & Riviera Maya, where flaming lava flows through the stalactite rivers, darkness covers the amphibious vehicle trails and underground rafts take you to the center of the Earth.